The author presents a solid ethical argument for significantly increased charitable giving to combat poverty among the poorest of the poor. One can quibble with some of the simplifications in his key argument, but saving a life or relieving serious suffering through relatively modest sacrifice on one's part is hard to argue with. One of the critics of aid he addresses, William Easterly, responds to his presentation in an article in the Wall Street Journal, March 4, 2009. He makes the key qualification which is the question of efficacy. Singer addresses this but ends up rather glossing over it, especially if we take seriously the idea of scaling up aid at the level he advocates. Since there is an almost total lack of transparency and evaluation of results from even the most reputable international aid agencies, how could we justify a huge increase in their resources in the near term? This doesn't mean that individuals shouldn't take seriously their personal responsibility, and even Easterly acknowledges there are many projects (if not agencies) whose effectiveness is demonstrable. But on a macro level Singer doesn't address how vast new amounts of aid would be used effectively. Also, Singer doesn't make clear that income should include all income - investment and earned, taxable and non-taxable, as from retirement accounts. If accumulated wealth isn't taken into account, then earned income would be "taxed" unfairly relative to unearned income or non-income producing assets that nevertheless represent means of the potential donor. 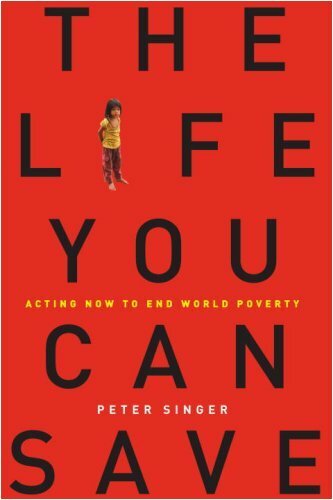 In this splendid little book about poverty, Peter Singer does a magnificent job of summarizing all the pertinent issues surrounding poverty and hunger in very simple, understandable, and practical terms. I wasn't sure what to expect when I decided to read it. My fear was that it would try to bash me over the head with guilt and pity. But I am happy to report that Singer does no such thing and that the book is far more sophisticated than that. The book begins with an overview of the problem both in terms of the extent of poverty and its effects and the juxtaposition of the fabulous wealth enjoyed by many other people. It then moves on to a fascinating discussion about human nature and psychology to help the reader understand how and why the present situation came to be. Then it's on to more practical topics such as which charities do a good job and which do not; and finally the nitty gritty discussion of how much people should give to good causes.